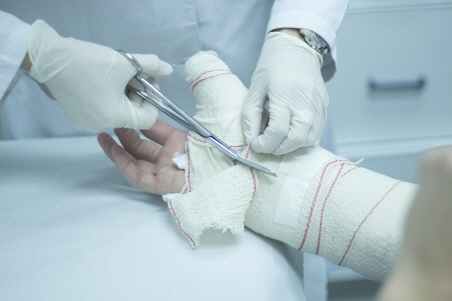 If you need surgery for your broken wrist, it will be done by an orthopaedic (bone) surgeon. Exactly what surgery you have will depend on what type of break you have. Your surgeon will talk to you about exactly what it involves, the risks, benefits, and how you are likely to recover. Your surgery will involve some metal (a plate, screws, or possibly wires) to line up your bones properly and support them while they heal. Occasionally the screws are held together with clamps and rods outside your skin. This is called external fixation. It is usually temporary, to hold your bones in place while complex surgery is being planned. Sometimes a wrist bone is so badly crushed that it leaves a gap when it is put back into place. If this happens to you, you may also need a bone graft, which will usually be done during your surgery. If you need a graft, the bone will most likely be taken from your radius (forearm), or occasionally it may be taken from your hip. You will probably spend one to two nights in hospital, and your arm will be in a splint for up to six weeks. You will need at least two weeks off work after surgery. Exactly how much time you will need off depends on which bone was broken, whether the break was in the hand you use most (your dominant hand), what your job involves, and whether there are any light duties you can do. For example, if you have a distal radial fracture (the break is in your radius), you will probably need just 10 to 14 days off work. But if the break is in one of more of your carpal bones, you are likely to need three weeks off if you are an office worker, but 10 or more weeks off if you are a manual worker. As you recover you'll have regular appointments with your surgeon, and some X-rays to make sure your wrist is healing well. You will also need some physiotherapy to strengthen your hand and get it moving again. Wires and external fixation usually need to be removed once you have healed. Exactly when that will happen depends on how bad your break was, and how quickly your bones heal. If the wires are underneath your skin you will need another operation to take them out. If they are poking out of your skin, they will be removed at a clinic appointment. You will be given some pain relief (such as laughing gas) or a local anaesthetic, which numbs the area. For two to three months after surgery you will not be able to lift or carry anything with the affected hand. You should also avoid sport or any other activity that may make your injury worse. Your surgeon will let you know when it's safe to start doing these things again. If you have wires that are poking out from the end of your wrist it's important to protect them from becoming caught on clothing, or anything else. You could pull the wires out this way, which would be painful – and you might need repeat surgery to put them back in. This can sometimes mean you don't heal as well as possible and your hand will never work as well as it could. Written by HealthInfo clinical advisers. Endorsed by orthopaedic surgeon, Canterbury DHB. Page created March 2017.